A powerful sequel to The Us, which ended with the son Ay wounded, rendered silent and immobile by a head injury. In Ay, the boy is propped up and worshiped, as others project a kind of divinity onto his stillness. While Ay recovers, in a series of lyrical monologues he discovers an individual self-awareness, separate from family and tribe. killed to make me alive. Ay will be offered too. Next world, will you have me? 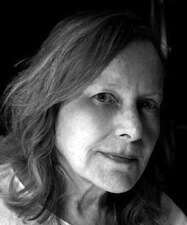 In addition to Ay, Joan Houlihan’s previous books are The Us, named a must-read of 2009 by Massachusetts Center for the Book, The Mending Worm, winner of the Green Rose Award from New Issues Press, and Hand-Held Executions: Poems & Essays. Her work has been anthologized in The Iowa Anthology of New American Poetries (University of Iowa Press) and The Book of Irish-American Poetry—Eighteenth Century to Present (University of Notre Dame Press). She is a contributing critic for the Contemporary Poetry Review and author of Boston Comment, a series of essays on contemporary American poetry archived at bostoncomment.com. She is founder and director of the Concord Poetry Center and the Colrain Poetry Manuscript Conference and she has taught at Columbia University and Emerson College. Currently on the faculty of Lesley University’s Low-Residency MFA Program in Cambridge, Massachusetts, she also teaches part-time at Clark University in Worcester, Massachusetts.